I first saw Kangas: 101 Uses in Nairobi in 1993 in a shop on Biashara Street. I've been thinking about this book ever since wishing I had bought it. Fast forward to 2009, I'm poking around on Simply Tanzanian for an Obama khanga and I find the kanga book! I bought both the khanga and book. Kangas: 101 Uses starts off with six pages of full color pictures of khangas. Each khanga picture has the Swahili proverb found at the bottom translated into English. The next page has two color pictures of kitanges and the next page has two pictures of kikoys. Kangas: 101 Uses gives a detailed history of kangas, how they came into existence and where the name came from. The authors also do an excellent job of describing the differences between khangas, kikoys, and kitenges referring to the full color pictures at the beginning of the book. Sarongs and pareos are mentioned as other cloths that can be used like a khanga. I've been known to use a pretty piece of cloth I picked up at the fabric store! After discussing the various terms used to create the various clothing styles, the first outfit to wrap is a simple dress. The instructions include several variations on how to knot and wear the dress. There are instructions for forty-eight different garments you can create with one or two kangas. Each subsequent garment is a little bit harder to wrap and knot than the previous one. Kangas includes instructions for dresses, skirts, toga, swimsuits, headwraps, head dresses, turbans, halters, and bras. The fun part comes with the next six items to make. This is the "You figure it out" section. Don't worry if you can't figure out how to wrap and knot those styles, there is a hints section. The last set of uses - numbers 55 through 101 are other types of uses for a khanga such as a rug, diaper, baby sling, and table cloth. Some of the uses are a little contrived, but none-the-less hilarious like using a khanga to distract an animal that is chasing you. I found this book to be very informative and enjoyable. The pictures are very well illustrated and instructions are clear making creating the various garments a pleasure. Personally, I've always wanted to know how to make a headwrap and now I do! 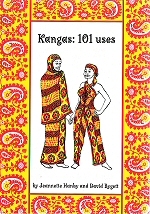 You can buy Kangas: 101 Uses through Amazon.com however, you may want to consider purchasing from Simply Tanzanian where you can also purchase a khanga or two along with the book. This copy of Kangas: 101 Uses was purchased by me with my own funds.